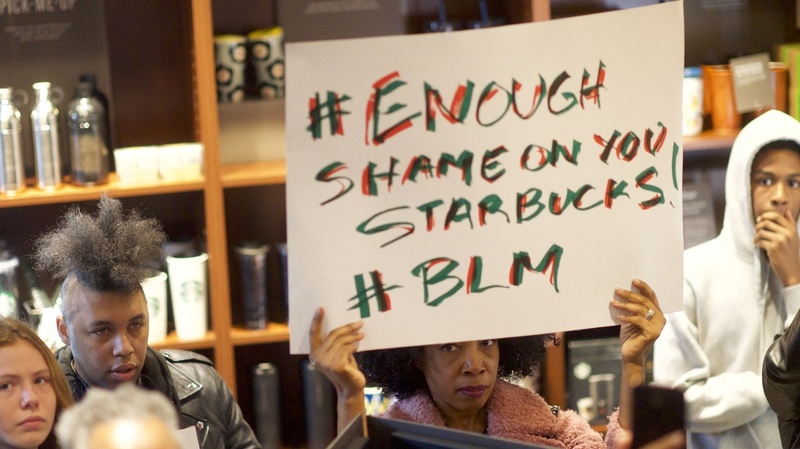 People Who Say Police Were Called For #LivingWhileBlack Ask Congress To Act Since two men were arrested at a Philadelphia Starbucks, there have been over a dozen more incidents of people calling 911 on people of color who were seemingly just living their everyday lives. The now infamous incident at a Starbucks in Philadelphia is far from isolated. Experts say it echoes a tragic past that excluded black people from public spaces. It happens while shopping for prom, waiting for a friend at a Starbucks, leaving an Airbnb or visiting a college — minorities, most often black people, are deemed suspicious by a white person, who calls the police. Starbucks: "I have two gentlemen at my cafe..."
But the now infamous Starbucks incident is far from isolated and experts say it echoes a tragic past that excluded black people from public spaces. Since that incident there have been over a dozen more, detailed below, of people calling 911 on people of color who were seemingly just living their everyday lives. Of course, not every call to 911 involving different races is about race, but this list of incidents points to an unsettling pattern. Those affected by it call it "living while black," and it spurred a hashtag that went viral. Now, some of the people who had 911 called on them for doing innocuous things like moving or napping are calling on Congress to hold a hearing so they can share their stories and find solutions. In an open letter they say "a racially-biased 911 call is a costly one, from the financial and time resources pulled from 911 operators to the protocol police officers must then follow. By assuming an excessive response, which risks arrest, incarceration, and death, generations of black lives pay the ultimate cost." The letter says the hearing should focus on holding false accusers accountable and examining "protocol practices." A petition in support of the hearing has received over 300 signatures. "Some white people become motivated to put black people in their place. Or tell them that they don't belong in these white spaces as it were," says Elijah Anderson, a professor of sociology at Yale, where a white student called the police on a black student napping in a dorm. There is no hard data on how often these calls happen. But it's not new. Thanks to social media, people are just more aware. A 2016 Pew Poll found that roughly half of black people surveyed said someone acted suspicious of them because of their race in that past year. "People are reacting to a feeling or a sense or this idea that they're the general manager of the universe that they can direct racial traffic with the help of law enforcement, where and what are the appropriate things that people of color, African-Americans in particular can do," says Katheryn Russell-Brown, a professor of law and director of the Center for the Study of Race and Race Relations at University of Florida Law School. On May 3, Mekhi Lee was shopping with two of his friends who were preparing for prom at a Nordstrom Rack. They bought a few items and left. But Lee said he forgot his hat in the store. They went back inside and Lee says a customer called the boys punks. They asked to speak to a manager and the employees told the boys they'd called the police on them. The boys left the store. Outside the police arrived. Over dispatch, Lee says the police said that three black young males had stolen several items. In the car they had receipts and their purchased items. "I was scared the whole time," Lee said. "The police pulled us over like we did something bad but we didn't do anything, all we did was shop. I was scared because I didn't know how far the situation could go." He was afraid — he'd seen situations where unarmed black men were mistreated by police or unarmed black men were shot. "I was nervous the whole time," Lee said. Nordstrom Rack has since apologized. Lee said it might not change the behavior right away but the company recognized that they were targeted for shopping while black. Donisha Prendergast, a filmmaker and Bob Marley's granddaughter, and Komi Olaf, a visual artist, were checking out of an Airbnb on April 30 in Rialto, Calif. with two other friends. They'd been in town for a festival put on by Prendergast's family. "A neighbor called the police reporting that she saw three black people stealing stuff and the police responded by sending seven police vehicles and a helicopter and we were surrounded in the middle of the community by all of this activity," Prendergast said. She posted a video of part of the incident on Instagram. Airbnb: "I'm observing a young black man..."
Police say it wasn't about race — a senior citizen saw strange people in her neighbor's house and called the police. They also say that no helicopter was used. But Prendergast and Olaf see no other explanation. The police didn't address their one white friend. On the 911 call, when the caller sees a white woman with them she tells the dispatcher, the dispatcher asks if it's the owner of the house. The caller says no and later says "I don't know. Maybe everything's O.K." Prendergast says she and her friends are considering taking legal action. "I asked the police officer if the woman would have called if we were three white ladies leaving the house. That was when I realized because their reaction to that question made me know that it was definitely a racially motivated call," Komi Olaf, the visual artist, said. The police dismissed the question. He wants to ask the caller why too. "I really want to understand what it was about my physical being or what it is that I was doing that appeared to be so threatening to this lady that she felt it was important to call the police," he said. Komi Olaf: "I really want to understand..."
"And jeopardize our lives," she said. "Whenever black people interface with the police we know that our lives are always in jeopardy whether it is that we ended up on the curbside face down on the concrete or we walked away alive. It's just by the grace of God, the universe that we walked away alive." Kenzie Smith was grilling with a friend in Lake Merritt park in Oakland, Calif. on April 29, when a woman called the police. The now infamous woman --wearing a navy sweater and sunglasses holding a green cell phone — has become a viral meme known as "BBQ Becky." Smith says the woman saw them grilling and said she was going to call the police. She told the police she was being harassed and the men were illegally using charcoal. Smith says he was profiled as a black man and is now going to run for Oakland's parks and recreation council to affect change. "She saw us and basically told us that we were trespassing on private property. She told us I was going to jail," she said. "She told us that we were not wanted she said and the citizen's arrest just continued — went on for three hours." "There are some people who just think that it's normal to call the police for anything," she says. Former White House staffer Darren Martin was excited to move into his new apartment in New York City on April 27. The Bronx native was happy to be back in his hometown. But then the police showed up in response to a report of an armed robbery. "I was hurt. I did feel unwelcome and at points unsafe because I know that there are folks here who are suspect of me," he said. What he wasn't, was surprised. He knew without his business suit on, some of his new white neighbors might deem him suspicious even with a U-Haul and clearly marked moving boxes. Darren Martin: "I still wear this black skin"
"No matter how early I get up in the morning to leave in my suit or how late I come back in my suit when I take that suit off I still wear this black skin," he said. "Folks see that and you're often criminalized as a black man you know for being black." A video he took of the incident went viral and he hopes it makes white people who call the police on black people recognize the internal biases that might be driving that call. Because false calls like the one made against him, could risk his life, he said. Someone told the police he was armed. He is leading the call for Congress to hold a hearing on the matter. On April 30, two Native American brothers were on a college campus tour at Colorado State University. Thomas Kanewakeron Gray, 19, and Lloyd Skanahwati Gray, 17, saved their own money to visit what was their dream school their mother told reporters at the time. But then a parent on a tour called the police on the two teens because they made her "nervous." She told the dispatcher they weren't part of the tour and were lying. She said they were "just really odd" and were wearing clothes with "weird symbolism or wording on it." On the call she is asked if the teens are white and she says "I think they're Hispanic, I believe," then adds "One of them for sure. He said he's from Mexico." CSU police call: "There are two young men..."
Body cam footage from Colorado State University's Police Department shows the boys being pulled off the tour and questioned. Police ask why they weren't responding to questions and Thomas says that Lloyd is shy. Lloyd then scrolls through his emails to find one showing he was registered for the tour. The boys' mother told reporters at the time that it broke her heart. The university said "We deeply regret the unwelcoming and concerning experience they had while guests on our campus," and offered to reimburse the prospective students for their costs to join the tour. They drove seven hours from their home in New Mexico to visit the school. The poetry group Muslim Girls Making Change arrived at the Elks Club in Burlington, Vt. to perform on May 7. The teens, two black, two brown, waited outside. They were excited, laughing and talking loudly. They'd just been invited to the National Education Association's Human and Civil Rights Awards ceremony. This year other awardees include Michelle Obama and Colin Kaepernick, a football player and human rights advocate. "We were like 'oh my God it's happening, I can't believe it's really happening' and everything. So we might have been a little loud," said Kiran Waqar, one of the teen poets. A man came outside and told the girls, "I've called the police and told them you're doing drugs." Kiran says they were all shocked. They were invited guests, and the only things they had on them were Arizona iced teas. "White people need to go through trainings and make sure that they understand before they act like that," Waqar said. "You know thinking about 'would I call the police if these were four blonde girls of color. Am I using the police's time well' ... it could have been resolved very easily if you just talk to us." The police confirmed they were called over kids being disruptive on the property. They responded and found that the kids were invited performers — the poets did perform that night. Other incidents involve people napping at a dorm lounge in Yale, golfing, going to the gym and working as a real estate developer.